York had shown me burns on his arms that he’d sustained in Hiroshima following the US attack. The blisters sprang up rapidly on the afternoon he’d been dispatched to the scene. I had always surmised that York’s deeply embedded scars were from piano strings “poppin'”on him. But one morning he told me the indelible piano tuner marks were intermingled with the effects of the A-bomb. 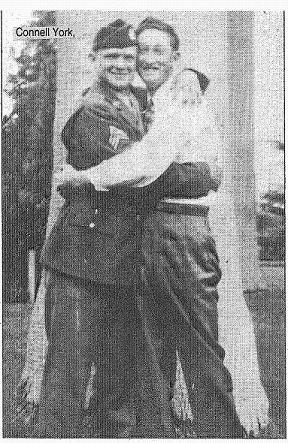 York dropped off a newspaper photo that showed him embracing his brother-in law, “Lonnie Rolen,” who returned from wartime Germany with shrapnel lodged in this lower spine. York’s commissioned officer stripes revealed in the snapshot were acquired when he was appointed as an army band leader. A cornetist, York recalled that he had made 18 jumps during parachute training maneuvers. YORK was a member of the distinguished 11th Airborne, US Infantry, and brought back a doleful Japanese melody to the home front, a heart-warming memento of his military service. He remembered the song the children were singing on the very day he and his buddies came upon them in a rural village outside Tokyo. The war was officially ended. York described the next scene with gripping emotion. “Since none of us spoke Japanese, we put our rifles down and opened our arms.” York’s voice was shaking and he was teary-eyed when he told and retold this story. On an overcast Wednesday afternoon he paid me an unexpected visit, sauntered over to my grand piano and plunked out the tune, intoning the first verse with Japanese syllables. Sensing that a piece of musical history was in the making, I feverishly jotted down all the notes and words as I heard them, and began a single-minded Internet hunt for the song that was based on the five-note pentatonic scale springing from the Asian culture. At first I contemplated a huge challenge in locating this melody because it arose from an experience dating back decades. But with a determination to push forward despite any odds stacked against me, I initiated a search for “Japanese Children’s Songs” that quickly linked to a Pacific Citizen website. It featured the article “Infectious Japanese Children’s Songs become the new ambassador of culture.” Within this writing, I noticed the quotes of “Masayuki Koga,” founder of the “Japanese Music Institute” in Berkeley, California whom I subsequently located through a telephone listing. As I sang the first few measures of York’s tune into the receiver using Japanese syllables, Koga immediately identified the song as, Usagi to Kame, “The Rabbit and the Turtle” more commonly known in the West as the “Tortoise and Hare.” With the impetus of this new discovery, I was off and running!. Through my preliminary cyber research I was able to soak up information about the rich cultural Japanese folkloric tradition. I had learned that the doyo, were composed during the Taisho Era (1912 -26) and were folk songs sung by mothers to help children go to sleep. These melodies were accompanied by verses that could be “very tearful and carry deeper meanings of identity and dislocation.” Certainly, the “Tortoise and the Hare” communicated a message to young and old that slow and steady wins the race. It was amazing how this theme resonated into the present. Finding the song title was like striking gold! With this newly acquired information, I went back to the Internet and further refined my search. To my astonishment, I found links to the actual song with the Japanese and English words written beneath the music notes. 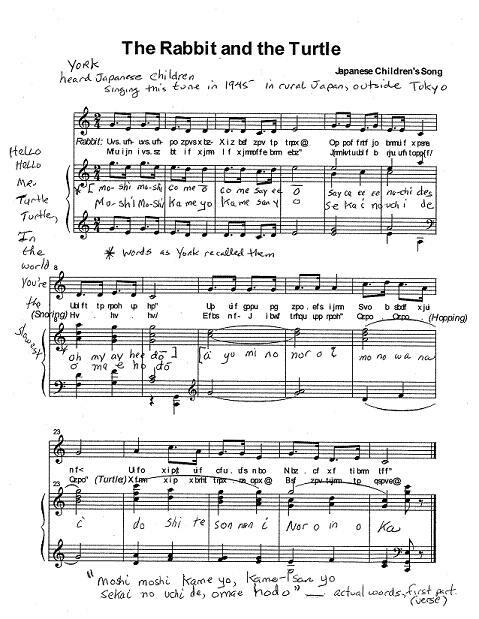 With renewed energy, I acquired two copies of the song–one with only Japanese syllables and the other with a simultaneous English translation that included the Japanese syllables exactly as YORK had recalled them on that memorable day in 1945. Next, I located mp3s of the tune (without choir) and recorded these into my modest portable SONY Tape recorder. Finally, after all my painstaking efforts, I invited York over to see and hear the notated tune he had thought was lost forever. I remember how he welled up with tears and was speechless for the longest time. It was an emotional experience I’ll never forget. To honor Connell York on this Father’s Day! Made me tear up hard there at the end with Connell. A good thing, a very good thing! Lovely post! Thank you.. Yes it was a moving story.